Participants at the CBSD Workshop, DR Congo. CBSD, a viral disease of cassava, characterized by brownish spots on the roots which make them totally or partially unusable, contributes to an estimated $100 million annual loss in income of African farmers. CBSD was first discovered in Eastern DR Congo and is rapidly spreading to other provinces in the country. The 4 year project, which seeks to prevent field losses due to CBSD in the entire Congolese communities, was officially launched in Kinshasa DR Congo, on April 13, 2017, by the national minister of agriculture, His Excellency Patrick Mayombe, in the presence of the secretary general of the ministry of agriculture, as well as representatives from National Agricultural Research Institute (INERA), the United States Agency for International Development (USAID), IITA, Food and Agriculture Organization (FAO), national and international Non Governmental Organizations (NGOs) and the media. The workshop was convened to discuss current project activities, exchange experiences, and to develop work plans and implementation budget for 2017/2018. 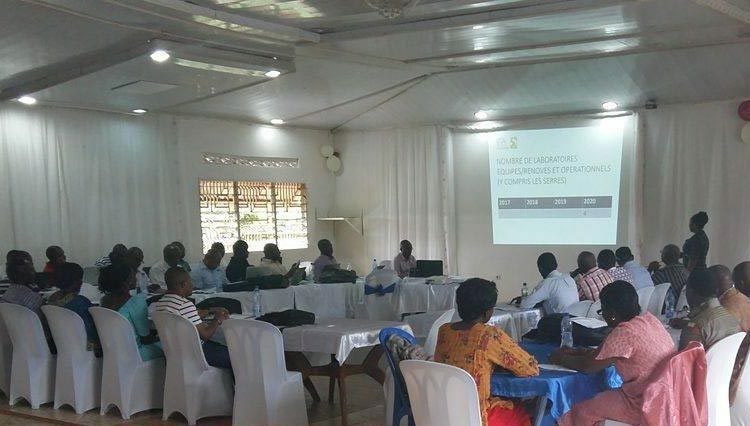 Delegates from USAID, INERA, University of Kinshasa, the Ministry of Agriculture (the national Extension Service (SNV) and the National Seed Service (SENASEM), FAO and IITA Kinshasa and Kalambo; attended the workshop. The project is implemented by IITA in collaboration with FAO and INERA and is funded by a US $ 4.6 million grant from USAID. It is led by Nzola Mahungu, IITA Country Representative in DR Congo.